This is my latest entry for Project Pastry Queen. Don’t be put off by the long list of ingredients. These come together very quickly and are fairly easy to make. 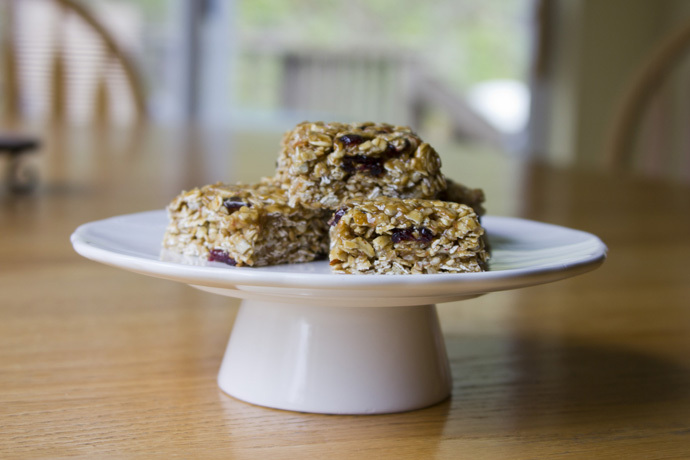 These bars are delicious, not too sweet, and full of nutritious oats, almonds, seeds and dried cranberries. I stayed very true to the original recipe. I only changed the sweeteners a bit because the original recipe called for a lot of honey, which I find to be too strong of a flavor. You can play with the combination of nuts, seeds and dried fruit. 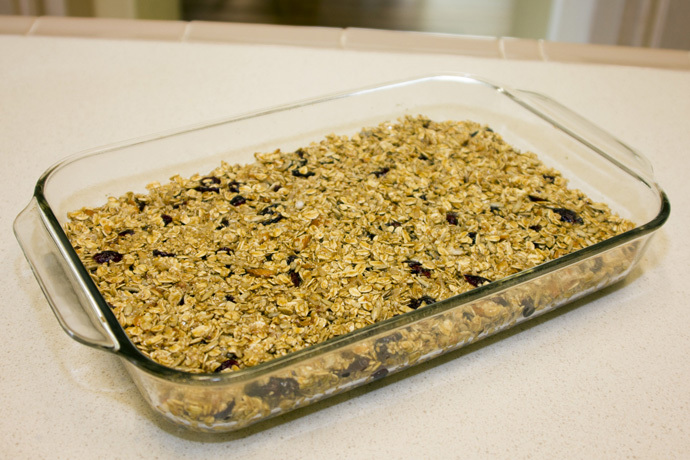 Try substituting pecans or pistachios for some of the almonds, or chopped dried apricots for the cranberries. Any kind of nut butter can be used instead of peanut butter. Also, these are gluten-free, and if you use coconut oil instead of butter, they are vegan. 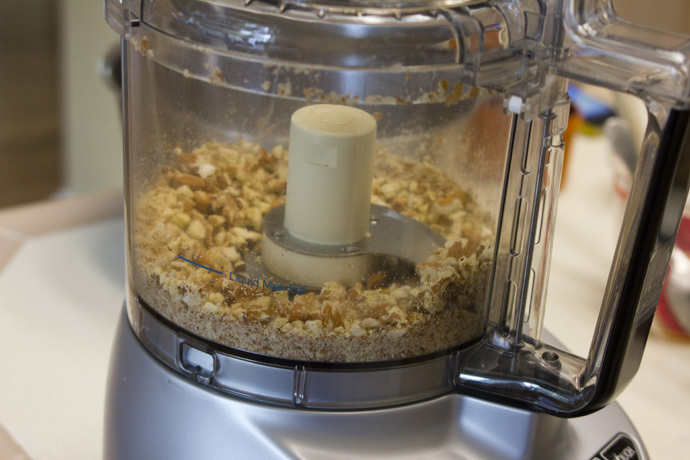 If you don’t have sliced or slivered almonds, you can chop whole almonds in a food processor. Boil the sweeteners until they reach soft ball stage. 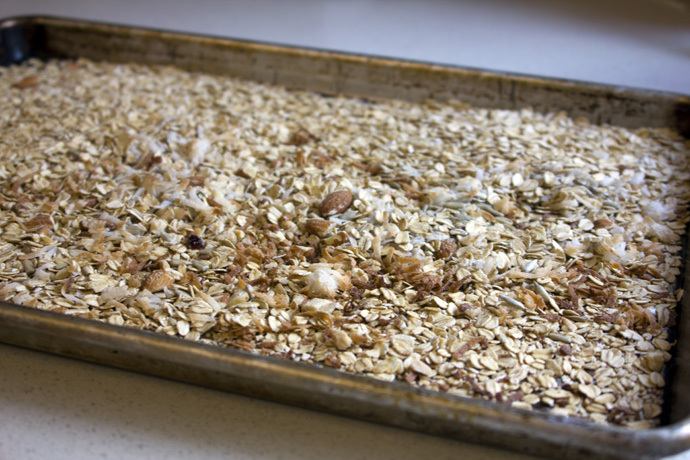 Spread the dry ingredients onto two baking sheets and lightly toast them in the oven. Bake until very lightly browned. 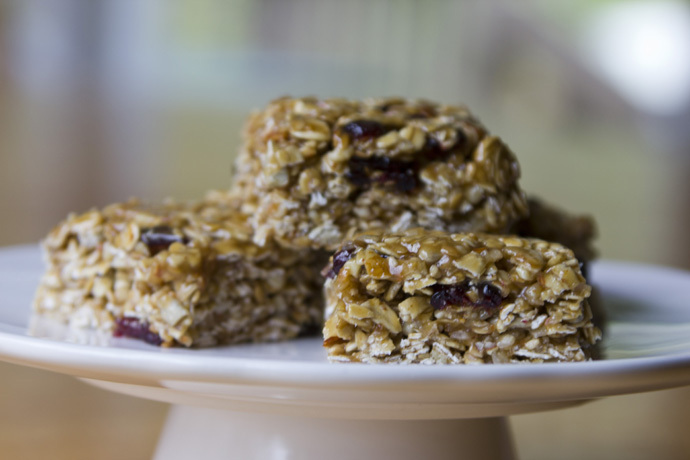 Slice into bars, and enjoy! Preheat oven to 350°F. Spray a 9 x 13-inch baking pan with nonstick cooking spray. 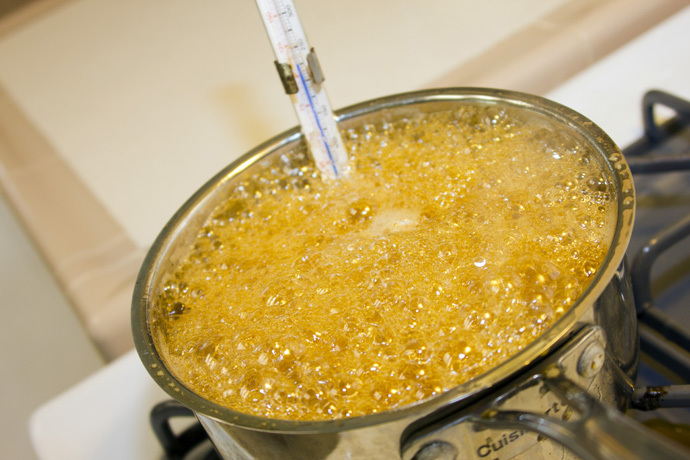 Combine the brown sugar, maple syrup, agave nectar or honey, and water in a 2-qt. saucepan over medium-high heat. Bring to a boil, reduce heat to medium and simmer approximately 8-10 minutes until it reaches soft ball stage, 234° to 240° on a candy thermometer. Remove from heat and stir in the butter or coconut oil, peanut butter and vanilla. 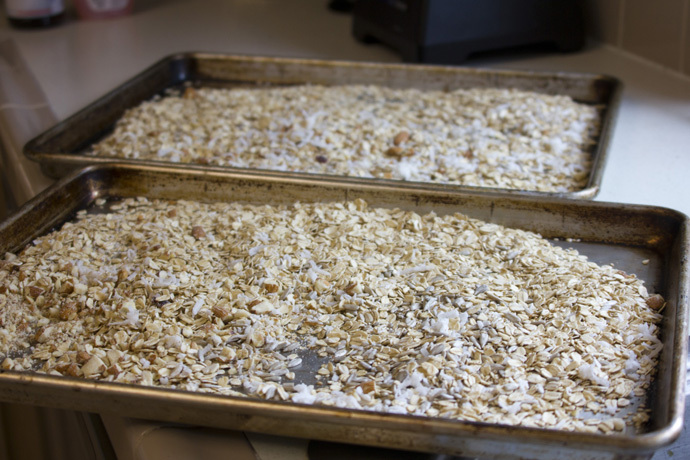 Spread the oats, almonds, coconut, sunflower and sesame seeds on 2 baking sheets. Bake for 7-10 minutes, stirring once, until lightly browned. 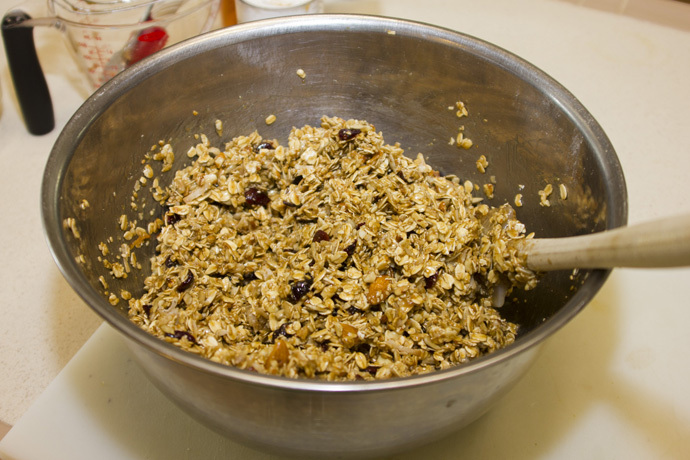 Place in a large bowl and add the cranberries and flax seeds. Pour in the syrup mixture and stir to combine. Cool for about 30 minutes, then pour into prepared pan. 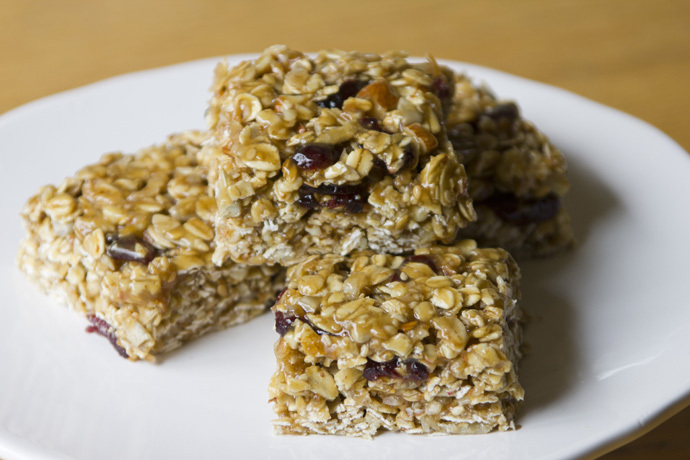 Press the mixture evenly and firmly into the pan, using a sheet of waxed paper or plastic wrap to prevent your hands from sticking. Cool another 30 minutes, or longer, before cutting into bars. Makes 16-24 bars, depending on how large you cut them. Wow, your bars look so professional! I like how you did the step by step photos. Missy, I am so proud of you! 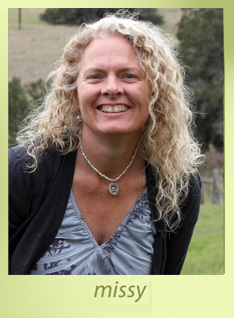 I love this new blog site. This is exactly what you needed to share your love for good food. And to anyone reading, these bars are incredible. I had them a couple of weeks ago.